About 10 of Myanmar’s 18 onshore and 25 offshore blocks will be up for bidding in the near future, the country’s energy minister said on Monday, August 27. However, local industry experts don’t expect the process to begin before November. Largely powered by hydroelectricity, Myanmar’s energy needs are dependent on the whims of its vast inland waterways. When rivers slow down, so does the country. This inconvenient reliance on hydropower has prompted the once-cloistered nation to open up bids for oil and gas exploration blocks to foreign investors, allowing for the establishment of assets to the critical energy supplies needed to maintain much-sung economic growth. “There are lots of unexplored areas in Myanmar,” K. K. Hlaing, chairman of SMART Group of Companies, a private oil and gas firm in Myanmar, told Inside Investor at a conference in Singapore on August 29. 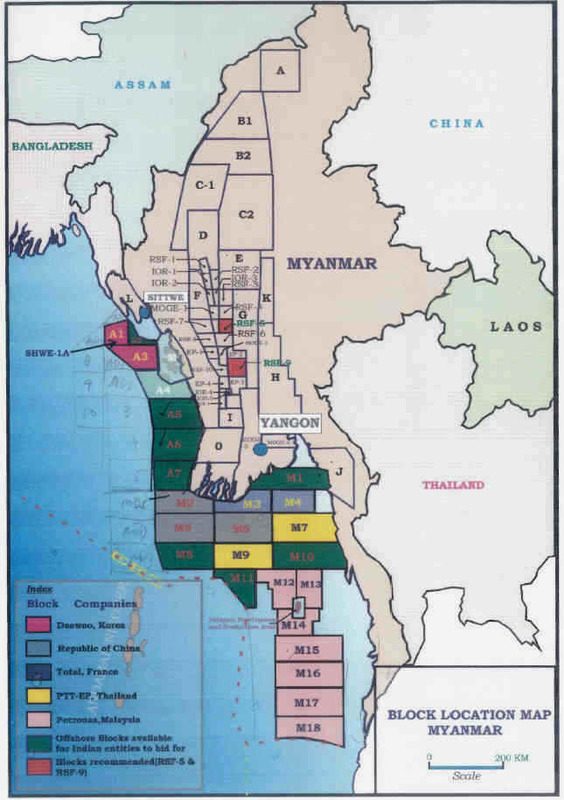 Hliang also pointed to the recent discovery of the offshore Shwe gas basin close to the Bangladeshi border, estimated to be between 4 and 8 trillion cubic feet. The Directorate of Investment Company Administration (DICA) in Myanmar expects the vast majority of foreign direct investment inflows to be steered towards the energy and oil and gas sectors over the next year – a sentiment that is already being concurred. Shell has began inquiring, while Hess from the US and PVC Well Services, a large publically listed company from Vietnam, have started feasibility research. Bidding competition promises to be fierce. Petronas, Malaysia’s state-owned oil and gas giant, and Sinopec from China have already set up operations in the country, to name a few – though not always with favourable results. All of the offshore wells that Petronas has drilled to date have turned up dry. This is a common trait of the terrain in a country that is not privy to a lot of geological information, nor a desirably amount of physical or human capital. All universities in Myanmar are run by the government, and options for secondary and vocational education are severely lacking. Printing of the kyat, Myanmar’s currency, is put into the hands of the military. Among other challenges, the spectre of corruption ever looms over investors like a “dangling sword,” said Rajiv Biwas, chief economist of Asia-Pacific for HIS Global Insight. “Corruption is high on the list of the biggest problems Myanmar currently faces,” he said, adding that as long as “reforms progress”, opportunities will finally materialise. All companies looking to invest in Myanmar oil and gas will come under a production-sharing contract with 100 per cent of investments allowed by foreigners. At the moment, there are no working permits available in Myanmar, and all foreigner workers must file for a business visa, however, much like other reforms in the country, permits could be implemented at a moment’s notice.